An interview with John Sallaway, the CEO and co-founder of vSpatial, a virtual reality platform that seeks to revolutionize the way we work. Is virtual reality the future of business? Will holographic environments replace real life offices? And will office buildings become obsolete, allowing employees complete freedom of mobility, their workplace being easily accessible by putting on a VR headset? Virtual reality has transformed the way we work, have fun and connect with others. The technology has become advanced enough to be capable of creating highly detailed and realistic 3D objects and even human characters. From big data visualization to virtual meetings with business partners located on the other side of the globe, virtual reality facilitates collaboration and increased work productivity. And innovative companies are constantly finding new ways to use this technology to adapt the work life to the changing lifestyle of the new generations. I recently had the opportunity to chat with John Sallaway, the CEO and co-founder of vSpatial, an augmented and virtual reality platform that seeks to revolutionize the way we work. The app places users within a fully-customizable virtual office with dozens of virtual tools to increase their productivity. During our conversation, John shared his expertise on the future of working, and how AR/VR platforms like vSpatial could prove to disrupt the way businesses and employees interact with each other. JASON: Could you explain vSpatial? What is it? How does it work? JOHN: You bet! vSpatial– the company — is a group of telecommunications, networking, cloud, and of course VR and AR experts with about 150 years of collective experience in those different areas. We are passionate about the future of work. We’re focused on the way millennials and Gen Z are going to work in the year 2020, 2025, and of course, into the future. We know that they want to be remote. They want flexibility. You see the growth of the “gig” economy. There’s been a decisive move into flexibility and remote options. But, we also know that those generations, really all of us, want connection and we want to feel like we’re working on something bigger than us–bigger than just ourselves. We know, intuitively and scientifically that human interaction is essential to collaboration and innovation. We can’t get great things done all on our own–we need to work together. So there’s a fascinating friction between this desire to be remote and flexible and this desire to be connected to people and have a sense of team and collaboration. And that is where the future of work and spatial computing (VR/AR/MR) intersect. In VR and AR, you can be anywhere in the world and connect with your team and your data in a way that has never been possible before – you can be in an immersive three-dimensional environment, while you talk to your team, and interact with two-dimensional and three-dimensional data. And that’s what vSpatial, the app, is. It’s a means of connecting users to one another and their data in a more meaningful way than today’s laptop, tablet and smartphone experiences. JASON: You are one of the co-founders right? What inspired you to start this journey, to create vSpatial? JOHN: I have sort of an unusual background for a tech startup co-founder. Back in 2016, when vSpatial was founded, I had been practicing law for about 10 years and was looking for a new set of challenges to work on. I had been friends with and worked in a volunteer and professional capacity with one of our other co-founders, Richard Platt. As luck would have it, Richard and I had lunch one day and I explained to him that I was looking to do something new. That’s when he laid out to me this vision he had of leveraging the power of spatial computing to create a virtual office where you could genuinely outdo anything that had ever been done in the world of productivity and collaboration applications. You could have as many big screen monitors as you wanted or watch a training video on a wall-sized screen, or share two or three applications with your co-workers while they did the same with you, and all while you talked to each other and used intuitive hand gestures to point and highlight and draw. It sounded like actually getting work done, rather than asking “Can you hear me?” or “Can you stop sharing your screen so I can share?” Remember, I had been stuck for over a decade using the traditional web conferencing solutions that everyone hates, so I was sold and I was inspired immediately, and I knew I wanted to be a part of it. At one point, I managed a team of 60 attorneys. Because of the unique nature of our work, we were all scattered in courthouses and home offices throughout the country. At that time, if an attorney wanted to call me and ask me about, say a landowner boundary, they would call and they would send me a picture on my phone or laptop of a map, and I would have to do the whole pinch and expand on the map thing, and they would say “look at that southern boundary: do you think landowner A or B owns that?” But look what we can do now just 2.5 years after Richard laid out his vision to me! We can now use our mobile VR headsets to meet in virtual reality together. That attorney and I, as if we were standing next to each other, can look at a map that is as big as us. And that attorney can point at a spot and circle it and I can see it. It is very literally like being in the same room together talking about this life-sized map. It’s not just science fiction anymore. You can actually do this and it’s much more than feeling like you have the cutting edge of technology at your fingertips. It actually makes your job more delightful because you are able obtain, share and interact with data better and faster. JASON: That’s really interesting. So, do you think it can replace the need for physical office spaces, or would you consider it a much-improved “second choice” for those who must work remotely? JOHN: I absolutely do think that it can replace physical office spaces and I think you’ll see a disruption to the commercial real estate industry that is tied to spatial computing. I’m not so bold to think that it can replace the need for all in-person meetings. I think there will always be a need for in-person meeting. For instance, you may choose an in-person meeting if body language is particularly important to the discussion. But I do think the vast majority of our need for physical office spaces could be replaced by VR/AR/MR. The numbers are also compelling. The average employee spends about 52 minutes per day on their commute, which translates to $2,600 per year in fuel cost. So that’s time and money that, as soon as you start to work remotely you realize is very valuable. On the employer side, the employer spends about $4,500 per year, per employee on office space. In San Francisco that number jumps to about $13,000 per employee, per year! That’s just the office space. The employer spends about $10,000 per year, per employee on IT costs. When you start talking about giving employees their time and money back while saving the employer money on office space and IT costs, you start talking about very compelling reasons to look to a virtual office. vSpatial is a group of telecommunications, networking, cloud, and of course VR and AR experts with about 150 years of collective experience in those different areas. Now, why is that scary to employers? Probably because there’s a feeling of accountability that comes with having an office-based work force. 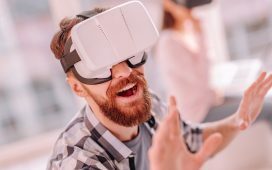 Employers think, “If I see my employee come into the office, I might not know exactly what they’re doing, but I’ll at least know they are there.” VR/AR/MR solves that problem too. Imagine a virtual office building with dozens of virtual workstations scattered throughout the space. In VR/AR/MR, you will see that your co-worker or employee has come in to their workstation, and there’s a real sense of presence because you are in the same virtual location – your office or workstation is right next to theirs, just like it would be in real life. You can then turn and give your employee a virtual tap on the shoulder or knock on their office door and instantly talk and share data. This allows employers to keep their employees happy with the remote work policies that they have come to expect but it is at the same time a meaningful improvement over having everyone in their home office with no ability to tell when they are actually at their desk or not. It’s an improvement for the employees because they get to work from anywhere but they feel less isolated and will be more likely to reach out to their co-workers to collaborate and get help and feedback. So when you hear about the power of the immersive experiences that spatial computing is delivering, it isn’t just about being immersed in a gaming or entertainment experience. You can also leverage that power to bring your teams together with a genuine sense of presence, even if they are scattered across the world. JASON: That makes a lot of sense. So, knowing what you know about where technology stands right now, how long do you think it will be until platforms like vSpatial become widely used to the point where it is accepted by employers as a means of reporting into work? We are not quite there yet, but we’re making incredible progress. For example, the Oculus Go, that was released in May. It’s a quality standalone experience, especially for business; a quality experience for under $200. It’s a standalone device that doesn’t need a cellphone and doesn’t need to be tethered to a computer. Then, you’ve got the Oculus Santa Cruz which we hope to hear about this week and the Magic Leap One, which was released this summer. These devices are making huge advances and will be the early drivers of meaningful adoption. JASON: So, vSpatial seems to be focused on maximizing the efficiency of those who work remotely or from home. It seems like the way you do this is by making the program compatible with virtually every app offices would use to produce work and communicate with each other. How do you present users with so many options for productivity without overwhelming them? JOHN: That’s a great question–I really like that one. I think there could be a tendency to overwhelm ourselves with information. Think about the world we live in today. You are likely working with laptop screens, external monitors and tablet and phone screens — you can easily become overwhelmed because you have so much information coming at you. We know that there must be a point at which you have so much information at your fingertips that you can’t process the information any more. We also know that we are more productive when we work with multiple monitors. In fact, a recent study showed that we are 10% more accurate and 30% more productive when we use multiple screens. But, there is a point, and it’s different for everyone, at which you become overwhelmed and are not as productive any more. We realize that and are very careful about it in the way we present our application. I wouldn’t describe vSpatial as overwhelming, I would describe it as empowering. You have the ability to arrange the information in a way that it feels good to you. We give users different places to put information depending on how important it is to them at the time. The primary place, right in front of them, is for information that is most important at that time. Then we give them other places to put information that may not be immediately relevant but may be useful to have at a moments notice. I appreciate your question because we have been very thoughtful ourselves about this particular issue. For us it’s not about blowing people away with 100 screens in front of them. It’s about helping our users be better at their jobs and that requires the freedom and flexibility to arrange your workspace in the way that works for you. JASON: Obviously, vSpatial is a new and revolutionary platform. What’s your vision for it in the long run? What new features do you expect to add going forward? How do you think it can be improved to meet your ultimate goal? JOHN: This is really fun to be a part of. The future of work and AR/VR/MR are going to intersect. We feel certain about that and to some extent we have a blank canvas to help define what that will look like. I think you have to look at the team we have assembled at vSpatial – do we understand the problem we’re working on and do we have the talent to solve the problem in brilliant and innovative ways? As a team we are passionate about thinking through every single element of your experience in our application. Everything from the way our virtual environment is presented to you, to the way you are able to arrange and interact with your data, to the way you interact with your team. But we aren’t simply trying to replace what can already be done in the physical world. With spatial computing you can go beyond what you can accomplish in reality. Traditional 2-dimensional screens hold our data hostage in a sense. In our application you’ll be able to virtually step inside your computer and walk around in your data. You’ll be able to use intuitive hand gestures and voice commands to interact with your data and carry out tasks that today take a lot of pointing, clicking and typing. We have ideas about ways we can help our users get a quick mental break; maybe it’s shooting hoops in our app, or listening to some relaxing music in a three-dimensional and relaxing space. Or maybe it’s our app helping you remember the action items that came from the meeting you just had. Did you commit to travel to San Francisco in a month? Did you need a reminder to book that flight? Did you commit to email someone and need a reminder to do that? And you’ll be able to do all of this from anywhere in the world with no need to carry around a laptop or tablet. For us it’s really all about making you better at your job and saving you and your employer meaningful time and money in the process. That’s all I can say but the sky is truly the limit. We are proud of what we’ve delivered but we are absolutely not done. JASON: Well, great. Thanks so much for taking the time to talk with us today, it’s been a great experience and super informative. I’m excited to learn more about how this technology will change workplace dynamics and even WHERE we work going forward. JOHN: Thank you for having me. It’s really an honor and exciting to talk about what you care so much about. Honestly, you don’t have to thank me, let me thank you! Jason Rose is a student at Harvard University in Cambridge, Massachusetts. He is passionate about augmented and virtual reality, and enjoys testing and reviewing AR/VR products.